2009 was not the greatest year of reading, but it wasn’t bad. It has less to do with the quality of what I read, and more to do with the quantity – and diversity – of what I did read. I had a lot of big plans to branch out in the types of reading I do (and I bought the books to back those plans up), but a stranger-than-fiction work schedule and a major mid-year reading slump derailed me a bit. Still, I read some good stuff, some thought-provoking stuff, some new stuff, and a I even re-read a favorite or two along the way. Here’s the complete list, followed by my personal Top Ten. 10. The Keeper by Sarah Langan: Moved beyond the haunted house story to become a haunted town story. Lyrical, taut, suspenseful, and peopled with great characters. 9. The Coldest Mile by Tom Piccirilli: I can’t say enought about this guy and his work, other than it’s frustrating to think of how many people have yet to discover him. His transition from horror to the darkest noir continues with this book, and proves that as long as he’s writing what his heart tells him to, we’re in for treat after treat. 8. Dark Hollow by Brian Keene: Stephen King used to describe his work as “the literary equivalent of a Big Mac and fries.” In other words, you knew what you were going to get every time you picked up one of his books, and as long as you liked the flavor you were sure to be satisfied. King left that description (one that I never really bought, anyway) in the dust a long time ago, but it fits Keene to a “T”. His novels aren’t bound for literary awards any time soon, but they are fast-paced, suspenseful, and a ball to read almost every single time. This is my favorite of all his work so far – and it’s not even a zombie book. 7. Dark Delicacies III: Haunted edited by Jeff Gelb and Del Howison: A collection of short stories that deliver page after page – and, in many cases, long after the book is closed. 6. Savage Season by Joe R. Lansdale: I’ve been reading Lansdale for a while, but this is the first time I’ve really got acquainted with two of his best creations, Hap and Leonard, two fictional characters who I find it hard to believe aren’t really alive somewhere, getting into trouble, sniping at each other, and spinning these outrageous tales for Lansdale to write down and deliver to us. These books are ones that I will re-read over and over again. 5. 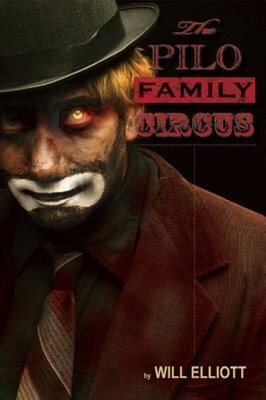 The Pilo Family Circus by Will Elliot: Weird, wild stuff. Psychotic clowns, a carnival of the damned, and more. Confounding and terrifying with each passing page. 4. Under the Dome by Stephen King: Midway through this 1,000+ page behemoth, I really doubted it would crack the Top Ten. It was good….but that was all. Comparisons to King epics like The Stand were being made left and right, but this one wasn’t – and isn’t – quite there for me. The last 200 pages moved like a house a-fire, though, and really lifted my opinion of this one. But King, as he’s been known to do, let me down a bit with the ending and the explanation behind the events of the book. Not his worst, and still among the best I read this year, but within the King canon it’s barely a blip on the radar. 3. The Reach of Children by Tim Lebbon: Lebbon, another writer who deserves a wider audience, teaches us the true meaning of “haunted” with this hearbreaking examination of grief and loss. An amazing story. 2. The Two-Bear Mambo by Joe R. Lansdale: Almost made it to the #1 slot by virtue of the reasoning behind the title. Another great entry in Lansdale’s Hap and Leonard series. 1. 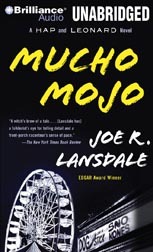 Mucho Mojo by Joe R. Lansdale: What can I say? 2009 was owned by Lansdale, Hap Collins and Leonard Pine. 2010 promises lots of good reading as I catch up with stuff released in 2009, anticipate the new books to come, and work to break down the To-Be-Read mountain that has taken over my office closet. A nice little review of the anthology Fifty-Two Stitches is available here. My flash fiction story “Sitting Up With Grandpa” is contained therein. You’ll be able to read that story online (and for free) on August 30th simply by going to the Fifty-Two Stitches website. If you’re one of them old fogies who’d rather have their reading matter on paper, by gum, then click here to preorder the paperback. My interview with former town crier/current irrealism novelist D. Harlan Wilson is now available at Dark Scribe Magazine. I’ve signed up for a load of book reviews over the next month or so, so keep an eye here for a note on when they are available. Also, I’m planning a couple of posts on movies I’m looking forward to as we wrap up the summer theater season. Things are starting to gear up for my favorite time of year, so you’ll see anything here from football rants to grilling recipes to Halloween stuff – stay tuned. Thought I’d start the year off with a look at what’s coming up. It’s already shaping up to be a pretty busy year, and I’ve got lots of plans to follow through on and lots (and lots) of writing to do. Out now is Shroud #4, which includes my tale “Three Graves” in a pretty packed lineup. Due out in the next few weeks, also from Shroud Publishing, is the charity anthology Northern Haunts, which has my story “Mother Ocean” in its 100-story table of contents. I just learned today that my story “To The Devil, His Due” will appear next Friday, the 16th, over at The Flash Fiction Offensive. Be sure and check it out. Finally, my story “Sitting Up With Grandpa” is scheduled to appear at 52 Stitches on August 30th. On the non-fiction front I’ve got some reviews and at least one interview lined up to appear at Dark Scribe Magazine in the coming weeks. Also, my work is coming soon to the best-named book review site on the Internet – Bookgasm. And there’s another project in the works – this one involving a regular column as well as, you guessed it, more book reviews. I’ll make an announcement about that one closer to publication time. I’m having a blast with all of this – thanks to all of those who’ve given me a chance to put my work out there for the world to see. Keep an eye here for (hopefully) more to come! Just got the tentative lineup for 52 Stitches, the online Flash Fiction project that kicks off in January. Looks like my story “Sitting Up With Grandpa” will go up on August 30th. Naturally there will be reminders around then, but I figured someone is bound to give you a calendar for Christmas (doesn’t everyone get a calendar for Christmas? ), and what better way to break it in than making a note of my new story? In closer news, I should be having some book reviews appear early next year at a popular site with a cool name. More on that when it happens. In the meantime, unless something big breaks, we’re going dark until the new year, when I’ll be back with my favorite books of 2008. Merry Christmas!